There are some good and bad Craps games available online and it is all going to be down to whether the house edge attached to each bet is low and worth placing in regards to which variant of Craps you finally end up playing. We have several online casino that are listed in our Casino Reviews section of the website which are going to offer you arrange of Microgaming games, and if you end up choosing one of those casino sites at which to play at you are going to come across a very fair and high paying Craps game, and below we have listed the betting opportunities available on this game along with information regarding the house edge of each individual betting opportunity. 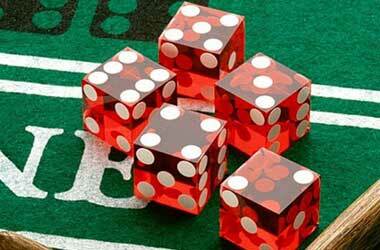 When you are playing Craps online you will be able to place one single wager on whether any single roll of the dice is going to result in either a 2 or a 12 will be rolled in, obviously with just two dice then these two outcomes on a roll of the dice are the ones which are hardest to get rolling in as to get a 2 the only way you can do that is by having both dice having the number one on their up facing sides and a twelve can only be rolled in by 2 x 6’s. When playing at Microgaming powered site these bets will return a winning payout of 30 to 1 but be warned the house edge on these bets is high at some 13.7%. If you opt to place your wagers on the Hardway 6 or 8 wagering opportunities found on a Microgaming Craps game then you will, if those number combinations get rolled in, will get a winning payout of some 9 to 1 based on the amount of cash you placed on that wager and the house edge attached to these bets are quite high at some 9.1%. You will get yourself a winning payout of 7 to 1 should you choose to place a wager on the Hardway 4 or 10 betting options on a Craps table and when this bet is placed and those odds are the ones on offer then the house edge you will be playing against is again quite a high which is going to work out at 11.1%. Probably the one betting opportunity that you are either going to love placing or will always avoid depending on just how you like to play the casino table game of Craps is the Seven betting options on the Craps table layout and this bet will return to you a winning payout of some 4 to 1 and the house edge this game plays out to is a large and rather unappealing 16.7%. You will be given the option of placing a one toll 3 or 11 bet when playing Craps online ad if this bet floats your boat so to speak you can if you place it and those numbers get rolled in win a payout worth 15 to 1 but be warned the house edge attached to this betting opportunity is large at 11.1%! For a bet that returns a winning payout worth 1 to 1 the actual house edge attached to the Big 6 or Big 8 betting opportunities is high working out at some 9.9%! You can when playing Craps at certain times in the game place a wager on the Place 4 or 10 betting locations on the Craps table and when you do and if those numbers get rolled in you are going to be rewarded with a winning payout that is worth some 9 to 5 of your staked amount and the house edge of this bet works out at 6.7%. Another place set of bets are the Place 5 or 9 bets and these will return a winning payout at odds of 7 to 5 and should these types of bets be the ones that you like to play when sat at an online Craps table at a Microgaming software powered casino site then you are going to find the actual house edge of these betting opportunities is lower than most and work out at just 4.0%. Another fairly popular betting option available on online Craps tables is the Place 6 or 8 bets, and if you fancy placing such a wager you will get a winning payout of 7 to 6 when that bet has been placed and those numbers then get rolled in. When you opt to play at any online Craps table which offers those odds attached to this wagering opportunity you are going to be playing against a house edge on that bet of some 1.5%, and by comparing it to the house edge of the other wagering opportunities listed above you can see that it is a fairly low house edge bet.